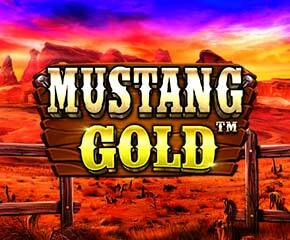 Pragmatic Play takes the players to the Wild, Wild West with their Western-styled video slot titled Mustang Gold. With as little as £0.25 and as much as £125 for each spin, you can trigger a free spins bonus round and earn an unlimited number of free spins. There is also a Money Collect and Jackpot Bonus round which can earn players a 1,000x stake multiplier. Read on to get more information on this online slot machine. 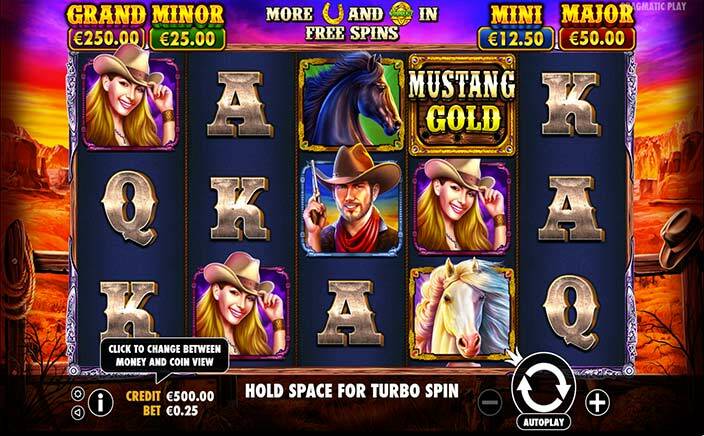 It is a Western-themed video slot played on a 5×3 reel set with 25 fixed paylines on offer. A view of the magnificent, but desolate Grand Canyon can be seen in the background. The 5×3 reel set is set against this background and on this reels set are low and high-value theme-related symbols. Some of the symbols on the reel set include a couple of wild, untamed mustangs, a rugged cowboy and a cute cowgirl. By landing 3, 4 or 5 of the black coloured Mustang on an active payline, you will earn stake multipliers of 0.4, 2 and 20x respectively. In Mustang Gold slots, you have Golden Horseshoes which act as a Money Icons and show up on every reel except for reel 5. These Money Icons also show up with randomly provided cash amounts. Where you have at least one Money Icon in view on the reel set as well as a Sheriff’s Badge Collect icon, you are instantly rewarded with the cash amount displayed on the Golden Horseshoes. Where you land at least 1 Money Icon with a Jackpot in view on the reels and you also land the Sheriff’s Badge Collect icon on reel 5, you will trigger one Jackpot Bonus round. You only need to select Golden Horseshoes to unveil the hidden Jackpot icon. By unveiling at least 3 identical Jackpot Bonus Icons, you will earn the Jackpot prize attached to that particular Jackpot Bonus Icon. In Mustang Gold slots, you have a total of four Jackpot Bonus Icons with Jackpot prizes. Land at least three Campfire Scatter icons on the second, third and fourth reel to earn 8 free spins initially. You can retriggered an unlimited number of free spins and the Money Collect bonus feature is fully active in this round as well. This is a video slot that leaves you yearning for more. Mustang Gold offers players a unlimited amount of free spins to boost their wins and payouts. In addition to this, there is a Jackpot Bonus and Money Collect bonus feature available.